He was the student and successor of Abu al-`Abbas al-Mursi, i.e the second khalifa after Imam Abu al-Hasan al-Shadhili. – His successor in the The Shadhili Tariqa was Sh. Dawud al-Bakhili. – May Allah be pleased with them all. Sh. Ibn ´Ata Allah was one of the great sufi imams, known as a muhaddith and Maliki jurist. He was the first to spread the Shadhili teachings in writing, and he authored many famous books such as the Hikam (Aphorisms), Taj al’Arus (Refinement of the soul) and many others. Ibn Ata’ Allah al-Iskandari was born in the middle of the 7th century AH/13th century CE and grew up in Alexandria during the Mamluk era. Although not much is known about his life, he had the best teachers in all branches of traditional sciences and became known as a great master of Islamic law of the Maliki School. His lifetime witnessed the great flourishing of several Sufi brotherhoods, including the Shadhiliyya, the Mawlawiyya, the Chishtiyya and the Ahmadiyya. His father was a student of Imam al-Shadhili, though it is unlikely he ever met him. Initially Ibn Ata’Allah was not so drawn to the Sufi path, preferring to concentrate his energies on jurisprudence. Yet, in spite of his early antipathies, he did become a disciple of Shaykh Abu ‘l-Abbas al-Mursi, (d. 686/1288). As his most important and principal work, the Hikam, attests, he had become a Sufi master in his own right, and was already a shaykh when al-Mursi died. He became the third great master of the Shadhiliyya order, which grew from Morocco and spread throughout North Africa and beyond. With his career as a scholar in Cairo under the Mamluks in full flourish, he died at around 60 years of age in 709 AH/ 1309 CE and was buried there in the Qarafa cemetery. Taj ad-Din Abu’l-Fadl Ahmad b.Muhammad b. Abd al-Karim b. Ata’illah as Sakandari, al-Judhami ash-Shadhili, known simply as Ibn Ata’illah as-Sakandari, was born in Alexandria, Egypt, as his family tree (nisbah) indicates, about the middle of the seventh [AH] /thirteenth [CE] century. His family were renowned Maliki scholars from the Banu Judham tribe, originally from Arabia. His grandfather, Abd al-Karim (d. 612 AH/1216 AD) had distinguished himself as an expert in Fiqh, usul (principles of jurisprudence), and Arabic, having studied under the famous Abu’l-Hasan al-Abyari. He had written several books, among which were al-Bayin wa’t-Taqrib fi Sharh at-Tahdhib, Mukhtasar at-Tahdhib, and Mukhtasar al-Mufassal, and had been very hostile to Sufism. On the other hand, Ibn Ata’illah’s father Muhammad (death date unknown) seems to have been of a different mind and although a Faqih (scholar), he was also the disciple of the great Sufi Shaykh Abu’l-Hasan ash-Shadhili (593-656AH/1197-1258AD), the founder of the Shadhili Sufi order. As a youth, Ibn Ata’illah received a traditional Islamic education in such disciplines as Qur’anic recitation, Hadith (Prophetic tradition), Tafsir (Qur’anic commentary), grammar, usul, philosophy, belles-lettres, and Fiqh (jurisprudence) under some of the best and most illustrious teachers of Alexandria, in addition no doubt, to the instruction given him by his own family. Ironically, in spite of his father’s attachment to the Shadhili master Abu’l-Hasan, Ibn Ata’illah was initially rather hostile to Sufism much like his grandfather, as he himself admits in his book Lata’if al-Minan, but not for any definite reason. In fact, what precipitated his meeting with Shaykh Abu’l-Abbas al-Mursi, the successor of Shaykh Abu’l-Hasan was an argument with one of al-Mursi’s disciples. Consequently, Ibn Ata’illah decided to see for himself who this man was after all, ‘a man of Truth has certain signs that cannot be hidden’. He found him holding forth on such lofty spiritual matters that he was dazzled. Ibn Ata’illah states that at that moment GOD removed whatever objections he previously had. Something had obviously touched his heart and mind, so he went home to be alone and reflect. That was apparently the turning point for him, for shortly thereafter Ibn Ata’illah returned to visit Shaykh Abu’l-Abbas al-Mursi who received him so warmly that he was embarrassed and humbled. Ibn Ata’illah states, ‘The first thing that I said to him was “O Master, by GOD, I love you”. Then he answered, “May GOD love you as you love me”. Then Ibn Ata’illah told him of various worries and sadness he had, so the Shaykh told him: There are four states of the servant, not five: blessings, trials, obedience, and disobedience. If you are blessed, then what GOD requires of you is thankfulness. If you are tried, then what GOD requires of you is patience. If you are obedient, then what GOD requires of you is the witnessing of His blessings upon you. If you are disobedient, then what GOD requires of you is asking forgiveness. After leaving Shaykh al-Mursi, he mentions that he felt that his worries and his sadness were like a garment that had been removed. From that time in 674 AH/ 1276 AD when Ibn Ata’illah was initiated into the Shadhili order until the death of Shaykh al-Mursi twelve years later, he became his devoted disciple and says that in all those years he never heard his Shaykh say anything that contradicted the Shari’a. What spiritual fruits he must have received cannot be known, but his development into a Sufi master capable of guiding and teaching others took place within the lifetime of his Shaykh, i.e., well within e twelve-year period before 686 AH/1288 AD. His discipline and progress in the path coupled with his great learning made him renowned as a religious authority. Still another miracle recorded is the story of three men on their way to attend Shaykh Ibn Ata’illah’s public lecture (majlis). One said, ‘If I were free from the family, I would become an ascetic’; the second one said, ‘I pray and fast but I do not see a speck of benefit’; and the third said, ‘Indeed, my prayers do not please me so how can they please my Lord?’ After arriving, they heard Ibn Ata’illah discourse and in their presence he said, ‘There are among people those who say…’ and he repeated their words exactly. Ibn Ata’illah taught at both the al-Azhar Mosque and the Mansuriyyah Madrasah in Cairo as well as privately to his disciples. However, it is not known where his Zawiyah was located. Shaykh Ibn ‘Ata’ Allah died at around sixty years of age in the middle of Jumada II 709 AH/November 1309 AD. As befitting an eminent and learned teacher, he died in the Mansuriyyah Madrasah. His funeral procession was witnessed by hundreds of people and he was buried in the Qarafah Cemetery in Cairo in what is today called the City of the Dead, at the foot of Jabal al-Muqattam. His tomb became famous as the site of homage, visitation, prayer, and miraculous occurrences. To this day this is still the case. This pious and extraordinary contemplative figure left behind a spiritual legacy no less impressive than those of his own beloved Shaykh, and the eminent founder Shaykh Abu’l-Hasan ash-Shadhili. All the biographers refer to Ibn ‘Ata’ Allah with illustrious titles and reverence and mention how marvellously he spoke and how uplifting his words were. In spite of the fact that he followed the Maliki madhbab, the Shafi’is laid claim to him, most probably because some of his earlier teachers had been Shafi’i scholars, not to mention some of his students. Hence, his disciples could only be all the more devoted in their attachment to and love for him. Of the untold numbers of followers that Shaykh Ibn Ata’ Allah had, both in Cairo, Alexandria, and elsewhere, only very few names are known. That is, doubtless, due to the fact that the Shadhilis did not advocate withdrawing from the world or wearing special clothing to distinguish themselves. They were ‘in the world but not of the world’, so to speak. Uno de los grandes imams sufies, también conocido por ser muhaddiz, imam y jurista Maliki, Abu al-Fadl Ibn `Ata Allah al-Iskandari (d. 709) es el autor de al-Hikam (Aforismos), Miftah al-falah (La llave del éxito), al-Qasd al-mujarrad fi ma`rifat al-ism al-mufrad (El objetivo puro del conocimiento del Nombre Único), Taÿ al-`arus al-hawi li tadzhib al-nufus (Lo mejor al respecto de la corrección de las almas), `Unwan al-tawfiq fi adab al-tariq (El signo del éxito relacionado con la disciplina del camino), el libro biográfico Lata’if fi manaqib Abi al-`Abbas al-Mursi wa shayjihi Abi al-Hasan (Las sutiles gracias en las vidas santas de Abu al-‘Abbas al-Mursi y su maestro Abu al-Hasan al-Shadzili), y otros. 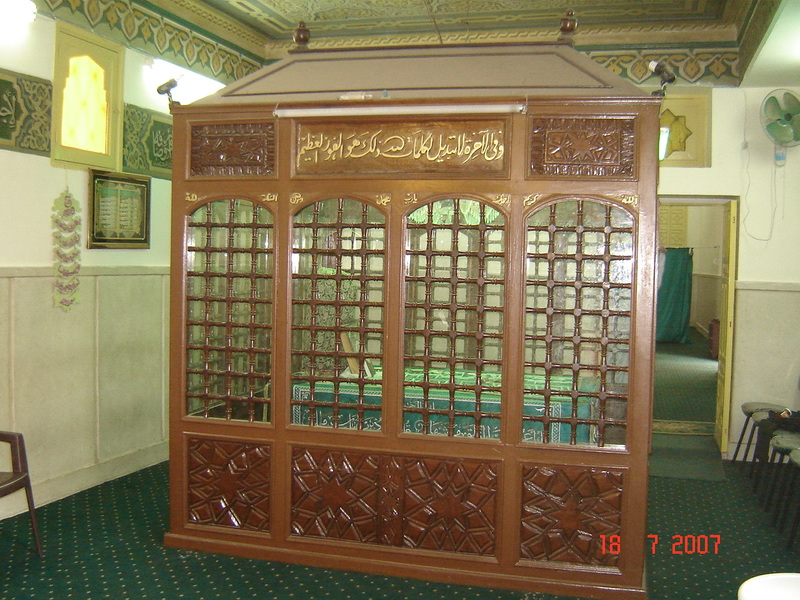 Fue discípulo de Abu al-`Abbas al-Mursi (d. 686) y el segundo sucesor del fundador Sufi, el Imam Abu al-Hasan al-Shadzili. Ibn `Ata Allah is buried in the Qarafah Cemetery in Cairo.